Combustible dust was to blame for 348 explosions, 793 injuries, and 133 deaths from 1980 to 2008. It is a terrifying hazard that goes overlooked in many facilities because it is not fully understood. Are you taking all the precautions necessary to ensure that your shop, and your employees, are safe? The Occupational Safety and Health Administration (OSHA) show some of the materials that may become explosive when divided into small enough particles here (PDF). There is a directive intended to reduce the occurrence of explosions and fire due to combustible dust. OSHA has launched the Combustible Dust National Emphasis Program (or Combustible Dust NEP) to administer safety requirements and fines where there currently is no code. Immediate action is to identify findings and impose fines on companies that have combustible dust that is not being managed or not managed adequately. The long-term action is to develop a suitable requirement. Click here to read more information about Dust NEP. 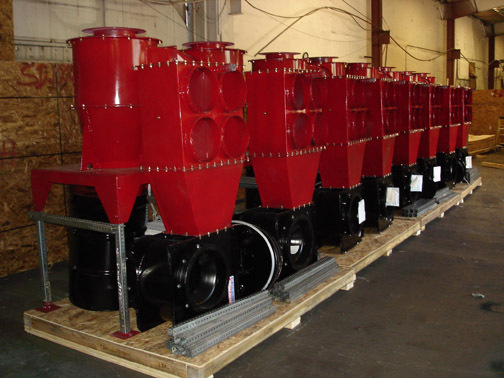 Standard Tools and Equipment provides cyclone dust collectors, cartridge filter systems and spray booths designed specifically for powder coating. These items are designed to meet, or exceed, the National Fire Protection Association (NFPA) and OSHA requirements. Our suggestion is for your safety team to review the processes for handling or creating combustible dust and to call us at 1-800-451-2425 if you find that combustible dust is a concern for you. If you have combustible dust, you will need processes and equipment to handle it. Please do not wait until after a catastrophe or visit from your OSHA inspector. Dust is an item that is much less expensive to handle before any such event occurs.